Publisher Summary: Sara wants to be famous, and when legendary rock star Jonathon Heat offers to take her under his wing and pay for her cosmetic surgery, it's like a dream come true. But beauty comes with a hidden price tag. Is Sara willing to pay? My Review: Strange book. Written partly as a faux-true crime book, Sara's Face is about Jonathan Heat (a Michael Jackson expy if ever there was one, with a dash of Bowie for good measure) and a teenager named Sara, who has a tenuous grip on reality, a manipulative streak, destructive tendencies, and a deep dislike of her own appearance. Bad combination. From the start of the book, the reader knows that something terrible will happen, but not the specifics. I think that's supposed to add tension and mystery, and it does, to a degree, but it's so plainly obvious what will happen that it's only the how and the why that remains mysterious. Luckily, the concept alone is hair-raising enough and the personalities of Sara and Heat both so morbidly fascinating that it remains a creepy page-turner. I do like the idea of a novel written in the style of true crime, but sadly, Burgess doesn't stick with it. He includes far too many specific conversations (nonfiction would have the basic gist of the conversation, with maybe a few specific lines) and sometimes includes Sara's (very detailed) thoughts at exact moments when he would have no way of knowing exactly what she'd seen, thought, and felt. Sticking with the true crime novel would have cut some scenes that he was obviously very fond of, but it would have made a better book. In fact, the parts of the book that stick most closely to the true crime style are the best by far. Of course, the basic premise is far fetched enough that I considered marking this book science fiction. Or fantasy, since the book hints at supernatural elements in a very underdeveloped way. There are a lot of unanswered questions, which is intentional, but it didn't feel necessary to me. I have to make note of a scene that happens at the beginning of the book that really took me aback. At Sara's high school, there's a gang of boys who regularly drag girls into a bathroom to feel them up. When they do this to Sara, she calls the police, the local news station, and informs the school. My personal reaction is to be proud of her and cheer her on in this. So when the narrative voice dismisses this as just more of her attention seeking behavior, I'm honestly stunned. Wow, really? Now, because of the style of the book, there's the question of whether the narrative voice reflects the author's voice, so I can't necessarily blame Burgess entirely for this. But it was offensive (if not exactly surprising) for me to read. 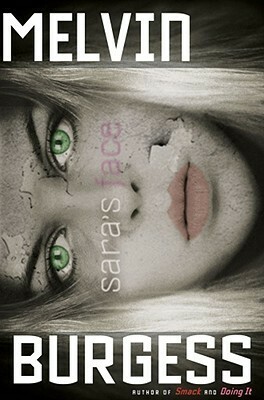 I do sometimes like books that experiment with style, and I love a good, creepy read, but Sara's Face fell a little flat for me.